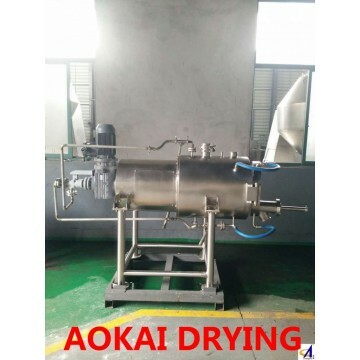 Suitable for powders, materials easy to oxidize, flammable and explosive materials, or toxic materials in pharmaceutical, foodstuff and chemical industries. The design and fabrication are compliance with GMP/FDA certification requirements. Special quick-opened front door. Inside easy to clean and maintain. Good applicability, fast drying speed. Use jacket and agitating blades to heat. High quality products. Uniform agitating of materials to be dried. Low steam consumption and low operation cost. Friction and pressure generated from the agitating make sticky materials separate to avoid caking. Easy to operate. Volatile gas can be recovered to reduce the pollution. Nitrogen nozzle designed at the bottom to quicken the drying and avoid agitating dead angle.